Ever since I bought my ice cream maker back in February, I have a mile long list of ice cream flavors I want to make this summer. Now that I finally got a copy of "The Perfect Scoop" that list has tripled, maybe quadrupled. I'm jumping on the bandwagon a little late here but man that book is a-ma-zing! 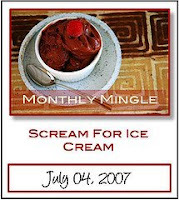 When Meeta announced the theme for this months Monthly Mingle, I had a hard time deciding which ice cream flavor to make. I finally settled on green tea ice cream (and whatdoya know David has a recipe for it!) with the intention of wrapping them in mochi, ala Mikawaya. Unfortunately, the mochi making turned out to be a disaster. It stuck everywhere and to everything. I could not get it off my hands let alone wrap it around ice cream. They weren't kidding when they said that stuff is sticky. (I read that not even the Heimlich can dislodge it!) Thankfully the ice cream was delicious so I didn't dwell long on the failed mochi. - I changed the milk/cream ratio because I didn't have enough cream and I felt almost guilty using as much as the recipe suggested, though I'm sure it would have made the ice cream even more delicious! I stuck with the recommended number of egg yolks, though I only had extra large eggs so the end result was a tad eggy, but again it was really delicious so no complaints. - And since my matcha was ancient, I had to increase the amount from the recipe's 2 tsp and regrettably I didn't achieve the brilliant green of the photographed ice cream in the book. Adapted from David Lebovitz "The Perfect Scoop"
Heat the milk and salt in a saucepan over medium heat until it is hot but not boiling. Meanwhile, whisk the egg yolks with the sugar until it's pale yellow and ribbony. Anchor your mixing bowl by placing a damp kitchen towel around the base of the bowl. Slowly drizzle in the hot milk into the egg yolks while whisking continuously. Return the custard mixture into the saucepan and heat over medium heat. Stir continuously with a heatproof spatula while making sure to scrape the bottom. Cook until the mixture is thick enough to coat the spatula and a line drawn across the back of the mixture on the spatula stays clear. If the line blurs then continue to cook it a little longer. Don't boil the custard. Add the matcha powder to the heavy cream then slowly whisk into the custard. Whisk the mixture until all the matcha powder has dissolved. Chill in the fridge for a few hours. Then freeze in an ice cream maker according to the instructions. Does green tea ice cream really taste like green tea? I've never had it but now want to pull out my little ice cream maker and try some. I could definitely taste the matcha in the green tea ice cream. As for matcha vs. green tea, I think matcha has a stronger fruity and grassy flavor than the green teas I've brewed at home and it's also less bitter. It's hard to say because I'm not sure about the quality of my matcha and green teas and I'm not very good at describing flavors. I think I would make the two ice creams separate but eat them together. :) Red and green on the same cone, would seem a bit like Christmas in July hehe. mmm love the 'green' taste and smell of matcha. i modified a recipe for matcha fortune cookies for a theme dinner awhile back. everytime i opened the oven i got a green tea blast. can't wait to try the ice cream recipe! 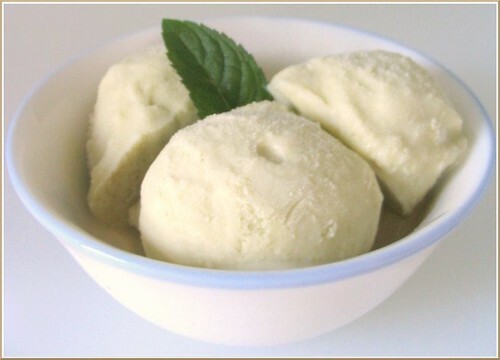 You don't need an ice cream maker to make delicious home-made ice cream! 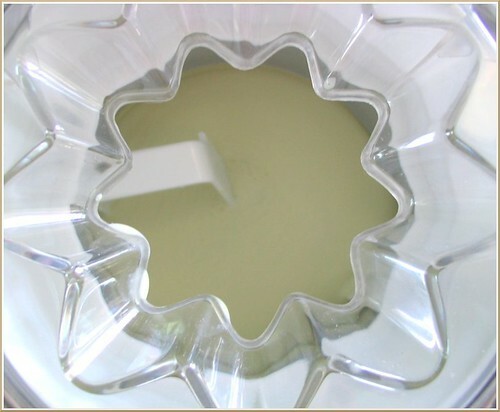 The old-fashioned way is not too labour-itensive: simply put the mixture into a container and place in the freezer. ~Goff and do something else, then give it a stir after half an hour or so... then again up to an hour later, and once again after that. Bingo. Ready. And you didn't need another gadget clogging up the kitchen. The texture is maybe a tad thicker, but I actually prefer it to the commercial 'perfection' of an ie cream maker. I love green tea ice cream. Sorry the mochi didnt work out. Yeah your matcha must have been really old the color is almost not there. How was the flavor, was it strong enough? Yes it was definitely very, very old and not as green as matcha powder. In fact I think it might be generic green tea powder and not matcha. Hm not sure since I can't read the japanese, hehe.